With power, you need handling. By changing camber, you need to adjust toe. Proper toe settings will make a significant difference in how the car turns in on the track and handles under load. 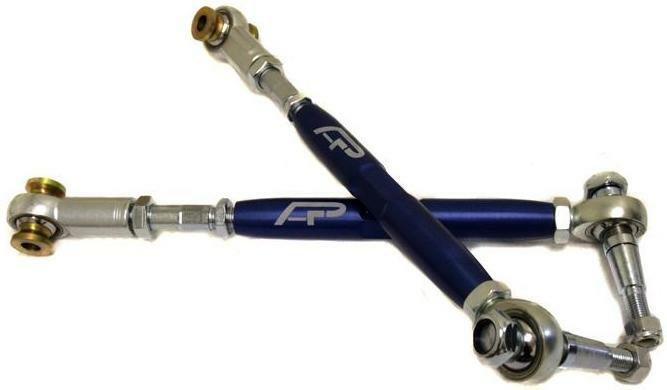 To compliment our other suspension products for the new 2008 Subaru WRX STI, Agency Power has released these all new Rear Adjustable Toe Arms. The CNC machined 6061 aluminum toe rods are anodized red with the AP logo laser engraved. The turnbuckle centers features machined flats for easy on the fly adjustments at the track. Each end has locking nuts to secure it in place once the adjustment is made. Connecting to the frame side of the car is one of our high end 3 piece spherical rod ends. Featuring a Teflon lining, the rod ends are extremely durable and noise free. Replacing the rubber bushings adds rigidity and improves handling response. Connecting to the wheel housing is an OEM replacement ball joint so you can have double adjustability. Combining these toe rods with our other Subaru WRX suspension bits will give you the ultimate handling ride.